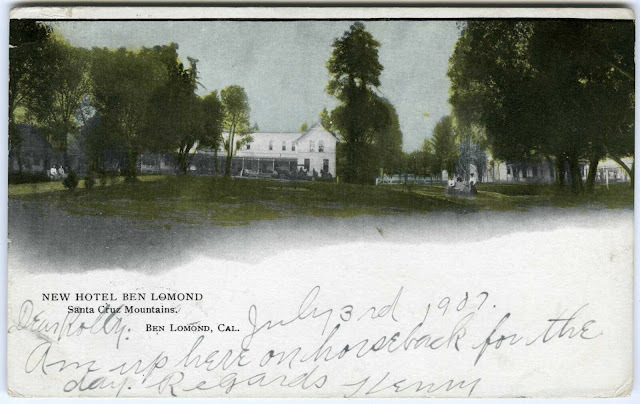 Ben Lomond's transition from a remote lumber mill to a resort community came rather suddenly in the late 1880s and early 1890s, yet surprisingly few resorts actually arose in and around the town. Part of the reason for this was that James Pieronnet Pierce of Pacific Mills still owned much of the land at the beginning. He, therefore, had some control of the town's evolution over the next two decades. Thus, while other towns were more wild in their development and entrepreneurs could experiment with new resorts, Ben Lomond was more like a planned town. The history of its resorts during the era of the railroad reflect this unique growth pattern. The first resort in Ben Lomond was the aptly named Hotel Ben Lomond. It was established in 1887 by Thomas L. and Weltha A. Bell, who were tasked by Pierce to found the Ben Lomond Land & Lumber Company and begin the commercial and residential development of the former mill properties. 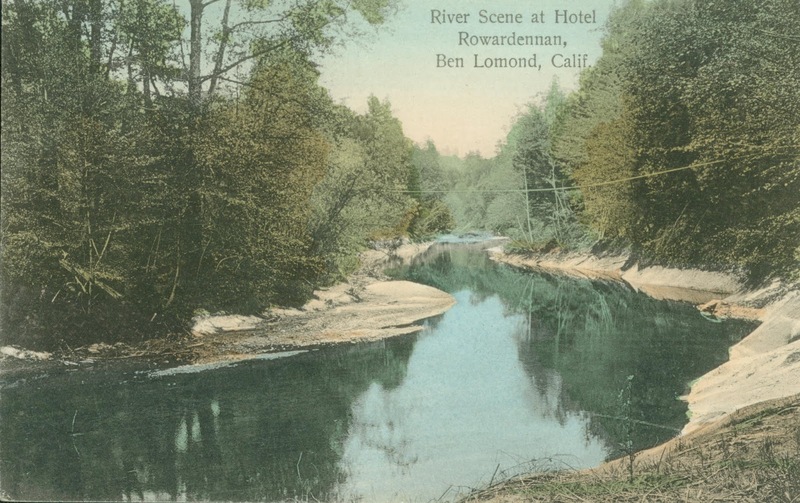 The hotel was situated on the northwest corner of town near where State Route 9 crosses the San Lorenzo River. Originally, it consisted of a two-story structure which hosted thirty-five guest rooms, a dining room, parlor, kitchen, and office. A wide veranda wrapped around the building. Around 1890, a separate club room was also built, which featured in it billiards tables and a small dancing area. Outside on the hotel grounds were four four-room cottages that could house families in the summer months. Below the hotel on the banks of the San Lorenzo River were several changing rooms (called "swimming baths") to allow people to enjoy the river. 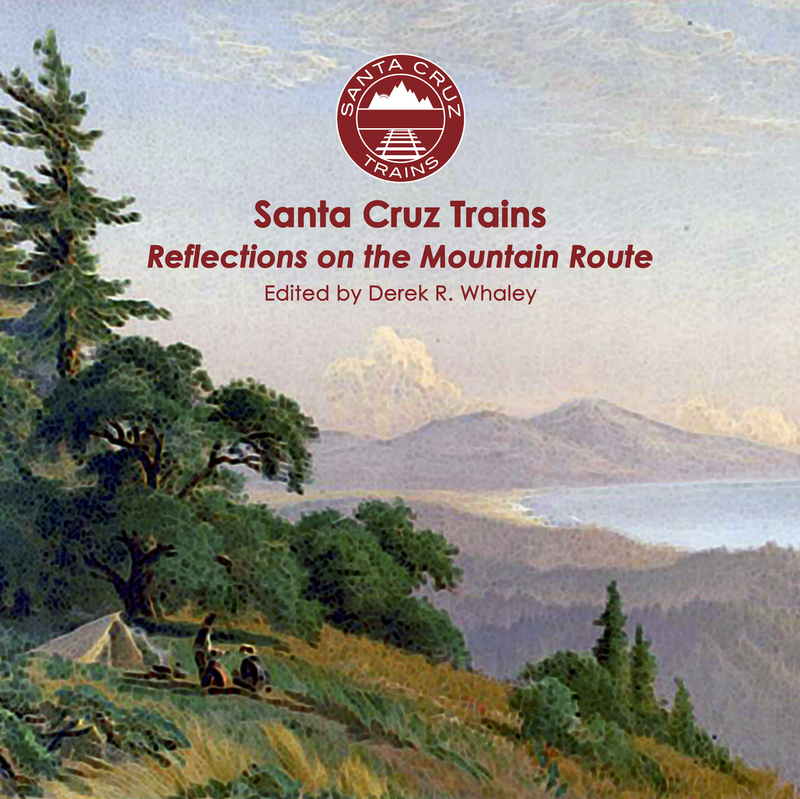 Fishing and hunting were advertised as key features, while the close connection to the railroad station meant that vacationers could also head to the Santa Cruz Main Beach to enjoy the Monterey Bay. The Bells owned the property for just under a decade, but their dreams of a mountain resort outgrew the size of their little hotel complex on the edge of town. 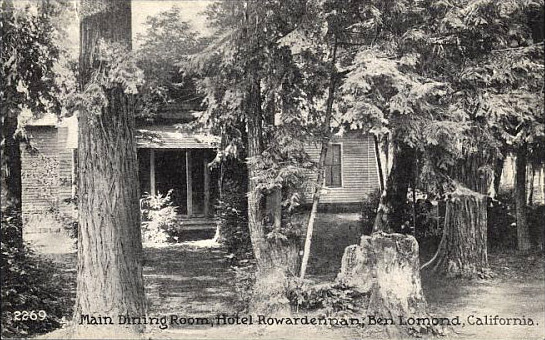 In 1896, they started fresh on the south side of town and founded the Hotel Rowardennan. In any case, the couple rarely managed the property personally. From 1890 to 1896, it went through no fewer than six proprietors, including M. A. Farrar (1890), W. K. McCollim and Charles C. Douglas (1891), W. M. Ward (1892), G. L. A. Smith (1893-1894, 1899), and James J. C. Leonard (1895-1898). This was high turnaround for such a successful resort and, in at least two cases, part of the problem was dishonest managers. The Bells sold the resort to D. W. Johnston, who allowed Leonard to remain as proprietor. The entrance to Hotel Ben Lomond, across the tracks from Ben Lomond Depot off Fairview Avenue, c. 1905. 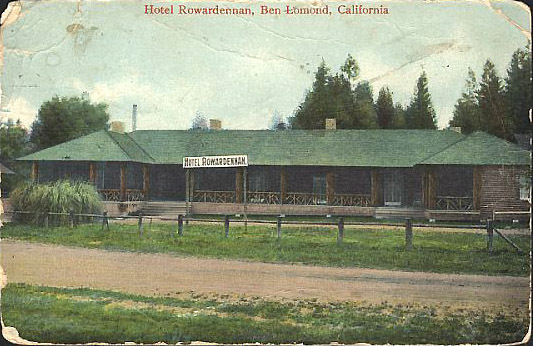 With the establishment of Hotel Rowardennan, Hotel Ben Lomond had direct competition. In 1896, an arms race began with Rowardennan. Whatever happened at one, the other copied it. In that year, Leonard added sixteen rooms to the hotel, increasing its capacity substantially. The next year, the river was dammed to allow a pool for boating, the dining room was enlarged, and 150 electric lights were installed. Despite the resort only consisting of 24 acres, compared to Rowardennan's 300, it could support 150 guests at maximum capacity. Despite the competition, Hotel Ben Lomond thrived throughout the 1890s and early 1900s. After two years of ownership under Joseph Ball, who also managed the property, the resort was taken over by Benjamin F. Dickinson, who had run Hotel Rowardennan on behalf of H. Francis Anderson for five years, during which time he founded separately Hotel Dickinson. He retained the latter even while taking over Hotel Ben Lomond. But this seemed too much for Dickinson and he sold the property in 1904 to F. A. Cory, who immediately began upgrading the hotel further with the addition of more guest rooms and a larger office, even going so far to incorporate the business as the Ben Lomond Hotel Company in February 1905. A few years later, though, Cody sold it to E. H. Scott, who in turn sold it to Lydia B. Sowell in 1910. A portion of the property was also parcelled off as a private residence at this time. Disputes arose in 1911 between the two new proprietors, leading to the sale of much of the furniture and other moveable goods at the hotel. It never recovered. On March 5, 1914, the end finally came for the resort. A fire started by the hotel's proprietor, Walter W. Everton, supported by its owners, C. A. Cooper and Ellsworth Beeson, engulfed the main hotel complex, including the parlors, kitchen, dining room, and bedrooms. Only out buildings such as the cottages and club house survived. Everton was arrested for the crime and all three were implicated in arson fires, made for insurance reasons, across the state. The property sat abandoned for fourteen years before becoming the Fairview Manor in 1928. The home now hosts a bed and breakfast. Located directly to the north of Ben Lomond depot, the Kent House advertised its central locale as its primary feature when it entered the scene in April 1894. Run by Martin B. Matson, a former employee of Hotel Ben Lomond, the hotel did not survive for more than one season. In 1895, Matson was arrested in Los Gatos for trying to pass a forged check. Not satisfied with the relatively small hotel west of downtown, Thomas and Weltha Bell reincorporated as the Ben Lomond Improvement Company in 1896 and constructed the massive 300-acre Hotel Rowardennan resort, which sprawled across the county road to the south of Ben Lomond and spanned the San Lorenzo River near its confluence with Newell Creek. 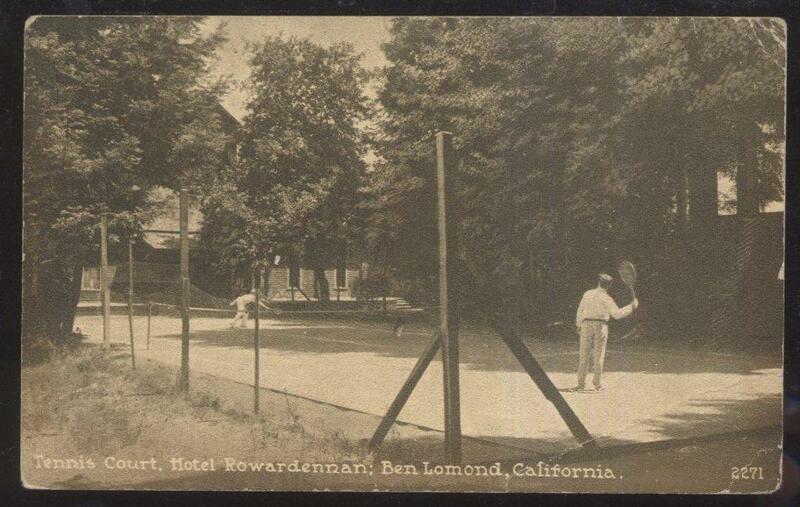 Unlike Hotel Ben Lomond, at least initially, Rowardennan featured tennis courts, campgrounds, forest paths, and boating along the river. A dam installed in the river created a swimming hole and also powered the hotel's electric lighting. 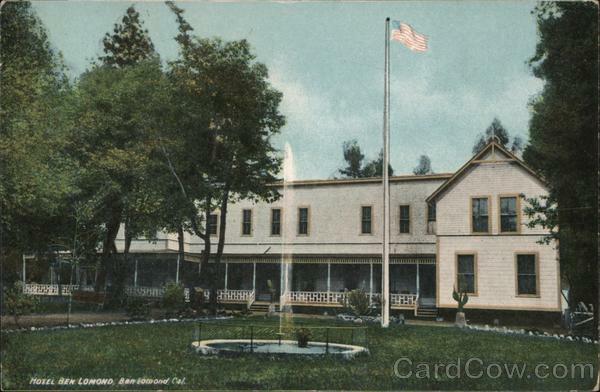 As happens so frequently with structures in the Santa Cruz Mountains, the original Hotel Rowardennan burned down in February 1897, only months after it opened, but the Bells rebuilt and the resort continued to grow. It was expanded to include a restaurant, billiards room, indoor dance hall, and a telegraph office. It had all the features any resort could wish for, but its year-round operations were bleeding it dry. In 1899, the Bells relocated to the confluence of Bean Creek and Zayante Creek to build the Arcadia resort (later Mount Hermon). They sold Hotel Rowardennan to H. Francis Anderson, the wealthy British owner of The Highlands (now Highlands County Park), who hired Benjamin and Gertrude Dickinson to manage the hotel operations. The Dickinsons were optimistic and eager to make Rowardennan profitable. Benjamin had been one of Pierce's lumbermen and had worked for Bell at the hotel previously. He also served as the assistant postmaster for Santa Cruz. Within a year of being hired as manager, the Dickinsons acquired the smaller tract of land between the Rowardennan property and the San Lorenzo River to the north, upon which they erected tent cabins and cottages for campers. The Dickinsons continued to manage Rowardennan off and on until 1910, after which the spun-off their adjacent property as Hotel Dickinson. The popularity of the picturesque resort began to decline in the 1910s. In June 1926, Anderson sold the property to Robert Barr and W. L. Morton, who renamed the resort Ben Lomond Lodge. By this point, Anderson had already sold off most of the property, leaving Barr and Morton with only twelve acres. It remained a popular dancing and music venue while vacationers continued to stay in the lodge and the surviving cottages scattered above the river. The partners also rebranded the resort an auto camp, designating an area along the river as campgrounds. The property was sold to G. L. James in 1928 and then Clara Warren in 1931. James had attempted to convert the hotel into a girls' school in 1929, but the venture never took off. Warren sold the property to Helene LaCraze in February 1932, but she would prove the final owner. Before the start of the 1932 summer season, the entire lodge and three cottages burned to the ground on April 9. Fourteen cottages survived, as well as several other amenities such as the dance pavilion. These allowed LaCraze to continue operating the resort at an extremely reduced capacity for the next two summers. But tragedy struck again in September 1933 when the club house, which housed a bowling alley, dance hall, and dinner tables, burned down. Only nine cottages survived and with these LaCraze hoped to rebuild the lodge as an entirely new establishment in 1934. But her dreams were shattered when, in February 1934, a third fire demolished the largest of the surviving cottages and damaged two others. The resort manager, C. Clementi, who ran a restaurant on the property, continued to advertise throughout 1935, suggesting something of the original property survived, but by 1937 the remaining buildings were up for sale again. Sal Christina purchased the abandoned property in April 1937 and demolished the structures, renaming the property Ben Lomond Lodge Park and subdividing it for sale as vacation rentals and permanent homes. Eight years later, Ben Lomond Lodge was registered as an official business again but little more is said of it in local media thereafter. The Rowardennan Lodge then appeared in 1947 but its relationship to the previous business is unclear and this new iteration disappeared in 1955. The site now hosts a swimming pool and private residences. In 1904, the Dickinsons purchased a large tract of land north of Hotel Rowardennan upon which they placed some tent cabins and cottages. In March 1910, they finally broke their arrangement with H. Francis Anderson and Hotel Rowardennan and founded Hotel Dickinson on their property. Initially, they simply built a small hotel structure, but in 1914 they erected a large lodge that served as the centerpiece of their resort. The Dickinsons never tried to compete with their neighbors by offering the same level of resort options. Theirs was a simple hotel meant to cater to an increasingly mobile population. In many ways, it was more a roadhouse than resort. Nonetheless, they did manage some amenities, such as the creation of their own swimming lake on the San Lorenzo above that of Hotel Rowardennan. 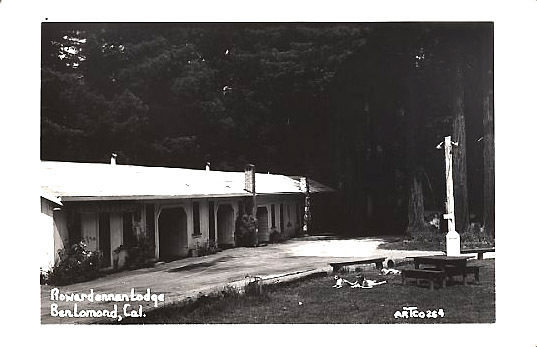 Throughout the 1920s, the lodge served as a popular meeting place in the San Lorenzo Valley. Concerts and galas were held there, as well as the monthly meetings of the local Chamber of Commerce. In 1927, The Cuckoo Clock tea house was opened at the hotel. 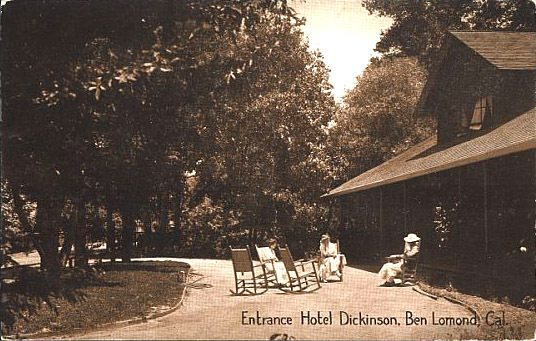 In fact, with the final destruction of the Ben Lomond Lodge in 1933, Hotel Dickinson briefly became the only high-capacity hotel in the Ben Lomond area. 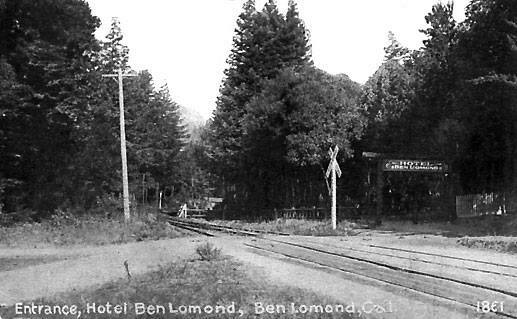 During the Great Depression, the hotel suffered somewhat from the Works Progress Administration project to redirect State Route 9 through downtown Ben Lomond. The new route of the road passed directly beside the hotel and required the demolition of its tea house, part of the main hotel structure, and a number of aesthetic features. Dickinson and his parneters, Tyler Henshaw and Fred Tubbs, sued the government for damages, arguing the hotel was not adequately compensated. The hotel won the case and was awarded $5,000 in damages. In 1936, Dickinson demolished the cottages at his hotel and sold them for scrap. Benjamin Dickinson continued to run the hotel until his death on July 29, 1943. The property was then sold by his wife and heirs to Gordon O. Perry in September 1945. Perry ran Hotel Dickinson as a night club as well as hotel, eventually renaming it the Town & Country Lodge in March 1947. The hotel was sold to Gene Gundel in June 1967 and continued to run as a hotel and cocktail lounge, but when it passed to Bob and Beverly Dakan in 1968, it became a restaurant and night club famous as a home of acid rock. Fire code violations and complaints by the public forced the club to shut down in 1975, after which it was sold as a private home to Rick J. Thomas. It reopened as an antique store called American Heritage Antiques in 1977 under the ownership of Mike Love and Dann Hewit. It has remained an antique store ever since, now called Towne & Country Antiques and Uniques, although the La Placa Family Bakery now sits on a corner of the former lodge. Advertisement for Lockwood's Grove, May 20, 1935. A late entry in the list of local resorts, Wilfred E. Lockwood's Grove only appeared on the scene in the mid-1920s as a rural auto camp. Local newspapers describe the resort as a "cottage colony" that probably sat in the vicinity of the St. Peter & St. Paul (Gold Dome) Orthodox Church. It was a popular convention venue for local mid-sized organizations and had at least ten cottages on the site, as well as a large camp bonfire pit and a swimming pool. Lockwood got a job for Strout Realty in 1941 and began subdividing his property the next year. The remaining resort property he sold in February 1951 to Lee Weatherwax, who sold the 80-acre resort in 1958. It probably became Redwoods on the River, a mobile home village at the end of Brown Gables Road. Vernal Lodge was little more than a four-acre property that its owner, the English immigrant Mary Theresa Dietz, wished to share with campers and vacationers in the summer months. She moved to Ben Lomond in 1897 and opened her tiny resort in the mid-1920s. All mention of the lodge ends in 1940. Dietz died on July 20, 1954. Brown, Randall. "The Magnificent Andersons." Press-Banner, 10/01/2015. Brown, Randall. "The Anderson Case." Press-Banner, 10/22/2015. Gibson, Ross Eric. "Vanish Resort's Glory Days Recalled." 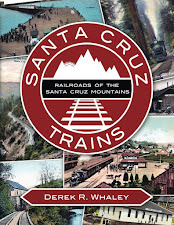 Santa Cruz Public Libraries—Local History Collection. 1993. Santa Cruz Sentinel and Santa Cruz Evening News, assorted articles. Loved reading the history of Ben Lomond hotels and resorts. It's amazing that Rowardennen was 300 acres! 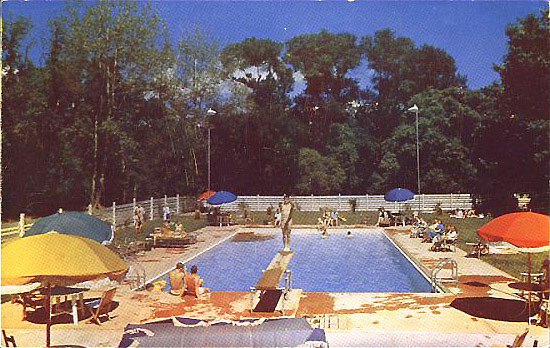 I spent summers in the 60's at Town and Country pool, my mother worked there for the Perry's so we could have summer passes. It seems Ben Lomond had it's share of scoundrels as well as upstanding citizens. Love this little town. Great information about the historic hotels in town! Loved hearing about Hotel Dickinson and Town & Country's "acid rock" night club & restaurant, shut down in 1975. Remember hearing several stories about the Doobie Brothers playing there and creating some of the best music, ever! The quality of music that came out of that era can never be repeated. What an amazing time to grow up. the music coming out of the late 60's thru the 70's was different. You knew you were hearing something incredible! You know, you're right about that. I saw something on eBay last year - it was an old contract for when Lynyrd Skynyrd played there, early 70s I believe. That had to be incredible.